An old though infamous loss to Mark Cavendish served as motivation for Heinrich Haussler who announced a return to form besting another pint-sized sprinter to win the elite men’s Australian national road championship today. 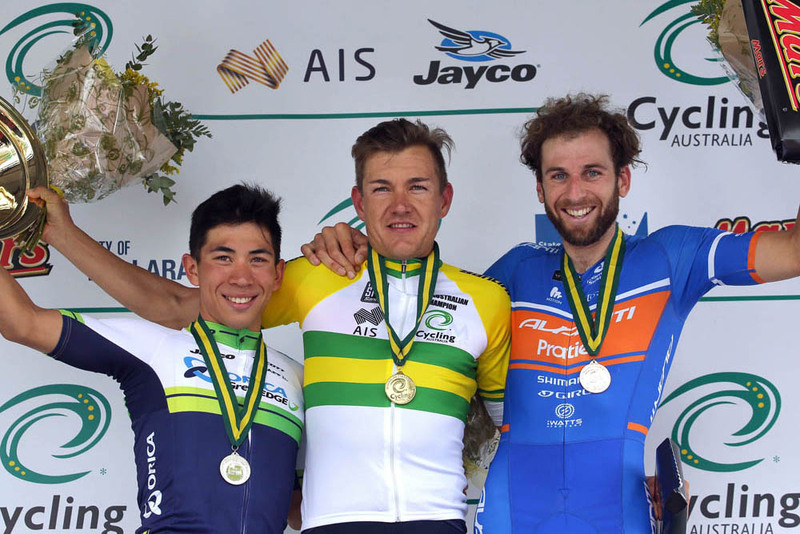 Haussler out-sprinted hyped neo-pro Caleb Ewan as well as Neil van der Ploeg to claim gold at the end of the 183.6km circuit race in Buninyong, Victoria, despite a mechanical at the finish. Whilst his victory was convincing the dual with Ewan nonetheless provoked flashbacks to the 2009 edition of Milan-San Remo where Cavendish surpassed the naturalised Australian Haussler on the line. “I didn’t necessarily learn anything from 2009 but in that last 100m where it was like edge, edge, edge, edge I was just thinking, ‘no, this is not going to happen again. It just can’t.’ I was just looking down trying to get everything out of my legs to get to that line first,” the jubilant 30-year-old said. “It worked out perfectly in the last kilometre because he [Ewan] followed an attack and then I was on his wheel. It was a full gas headwind and I didn’t know he was going to hit out early but I kind of had the feeling he was. He did and I just waited, waited, waited and in the last moment tried to come around. A cool and calm Haussler used experience to his advantage in the final 10.2km lap of the race that incorporated the renowned Mt Buninyong climb, where he was dropped only to later re-join rivals on the descent to the finish. Haussler was part of a 15-man break that established early in the race and he ensured he remained at the forefront of affairs when new selections were established throughout the day. The gold medal winner also proved numbers aren’t always paramount. He started with sole IAM trade team-mate David Tanner against a field comprised of WorldTour and domestic outfits that in some cases had upwards of 10 riders. None of the major favourites in Cadel Evans or Richie Porte prominently featured in the gruelling event that 57 riders, from 149, finished. Evans came in 52 seconds adrift of the winner in 11th with Porte 22nd. The elite men’s title concluded the Australian championships that saw Peta Mullens win the gold medal in the women’s race on Saturday ahead of Rachel Neylan and Shara Gillow. Miles Scotson claimed the under-23 men’s title. Haussler will debut the green and gold jersey later this month at the Tour Down Under in which he is hopeful of winning a stage before moving onto the Tour of Qatar and then another Spring Classics campaign that is set to include a Milan-San Remo title tilt.